Discussion in 'Magazines' started by MDNA, Feb 1, 2019.
navyvelvetbowtie and crmsnsnwflks like this. 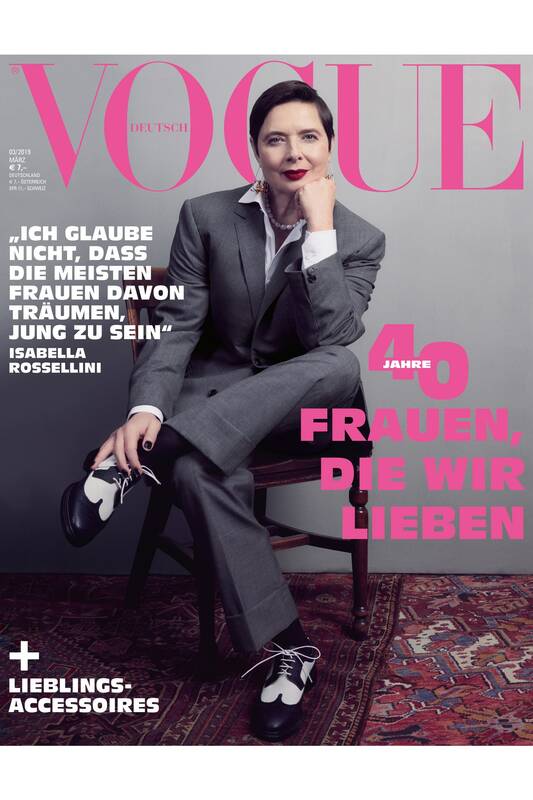 What happened to Vogue Germany? They had some great covers in 2017 and the start of 2018 but then they all became uninspired grey studio shoots. Did she style herself?! This is beyond uninspired ‍♂️ were supposed to spend money on this? And obsessed with celebs. This is the third celeb cover for the year. Very odd for them. Based on that coverline and Isabella, I think this will actually be yet another hit for them on the newsstand. More bait for the Brigitte reader. I do like the cover image though. Styling and colour scheme for me looks great. Isabella just naturally exudes a certain sense of confidence. The same confidence which one would associate with Marlene Dietrich. What they do need to work on is that font! Very disappointing. So unimaginative. I have the impression I've seen that picture of Isabella many times before. I quite like Carolyn's cover though. Ugh, multi-covers again! Why not just go with Isabella??? 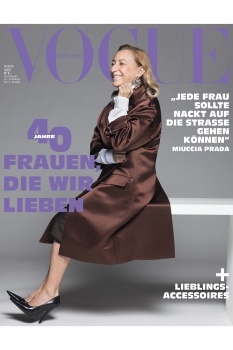 Miuccia's got the worst cover! Cold and sterile, very much doubt it will perform well especially with that eye-rolling coverline. Quite like Carolyn's, and agree with that coverline. It's their celebratory year, so they are probably trying to get as bigger names as possible. The problem is it doesn't look like a retrospective at their legacy, it just looks random. I wouldn’t be surprised if we end up with 40 different covers for this month. They did 25 covers for their 25th anniversary issue. So anything is possible. TZ001 and phungnam96 like this. I like Isabella's cover. Even though it is a bit too simple, she looks very elegant. dfl-001, MDNA and Benn98 like this. Miuccia Prada, queen of style. I want those shoes! What a waste of a fabulous outfit for such a terrible cover. Great cast... I don't mind Isabella's styling as Dietrich came to mind but the shoot is boring. Could have really went for it. The rest is lackluster. Carolyn and Camilla FTW, don't like the other two covers. Love seeing them all, but not a single great cover, wow! Also they will be celerating 40th Anniversary all year? Which isssue is exactly "the one"? They haven't got an effing clue. These look like they were made on Paint! That quote from Miuccia really takes the cake, as if you would ever catch that coming out of her mouth! Lame covers...Carolyn's looks like an I&V outtake from circa 2005. They all deserved better than this.